What is it, what causes it and how can symptoms be relieved? We use our mouths every day to eat, smile, speak, and more. Saliva is important to maintain a healthy mouth. When the quantity and quality of saliva decreases, oral diseases can develop very quickly1. Saliva also washes your teeth providing minerals for repair, and helps prevent bacteria, viruses and fungi from causing tooth decay and gum disease2. Reduced saliva flow is known as dry mouth, an uncomfortable condition that can affect a person’s ability to speak, chew and swallow food comfortably1. Dry mouth is known as xerostomia3, and although it is common, it is frequently overlooked4. Because there is very limited statistical data about xerostomia, prevalence estimates can range between about 1% and 64 % of the population3. There are many possible causes of dry mouth, which include a range of medical conditions, medications, dehydration and smoking2. In fact it was reported that there are over 400 over-the-counter (OTC) and prescription medications that can contribute to dry mouth, or make it worse. These include antihistamines (for allergy or asthma), antihypertensive medications, decongestants, pain medications, diuretics, muscle relaxants, antidepressants4 and opiods4. Some chemotherapy and radiotherapy treatments can also cause dry mouth3. Older people have a much higher incidence of dry mouth, with it affecting approximately 30% of patients older than 65 years and up to 40% of patients older than 80 years3. Various diseases can also cause dry mouth, including Sjögren disease, which is the second most common autoimmune connective-tissue disease and is most frequently associated with salivary dysfunction and dry mouth3. Actually, in people with Sjögren disease or in those receiving radiation therapies for head and neck cancer, the prevalence of dry mouth is much nearer to 100%3. Other diseases associated with dry mouth include Cystic fibrosis, HIV/AIDS, poorly controlled diabetes and uncontrolled hypertension to name a few3. Symptoms of dry mouth can include a sticky, dry, or burning feeling in the mouth, trouble chewing, swallowing, tasting or speaking, a dry or sore throat, a dry, rough tongue, hoarseness, halitosis (bad breath) and even mouth sores4. Having a dry mouth also increases your risk of developing dental decay and gum disease2. But what can be done about this uncomfortable yet often ignored condition3, 4? Some advice for a person with xerostomia is to sip water frequently, especially after meals, and after taking medications. They should also limit food and drinks that contribute to dry mouth such as sugary food or drinks, fruit juice, sports drinks, energy drinks, tea, coffee and alcohol as well as dry, salty or spicy foods. Using mouthwash that contains alcohol is also not recommended2, 3. Chewing sugar free gum may also help, BUT iNova Pharmaceuticals has now introduced an exciting new non-medicated soft Pastille, that is specifically formulated to help relieve, sooth and protect a dry mouth and throat6. 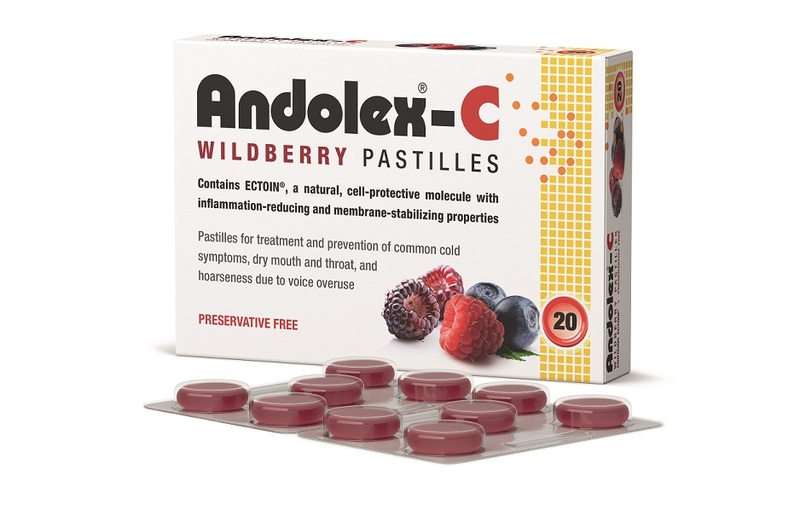 New on the shelf to help relieve symptoms of dry mouth and itchy scratchy dry throat are Andolex-C® Wildberry Pastilles. These pleasant mild Wildberry and menthol flavoured preservative free soft lozenges contain the natural ingredient Ectoin®, which forms a protective and moisturizing shield in the mouth, to help reduce and prevent symptoms of a dry mouth and itchy, scratchy throat6. Those suffering with dry mouth should speak to their dentist, doctor or pharmacist about products available to help. Andolex-C® Wildberry Pastilles are now available at leading pharmacies countrywide. For more information, go to www.andolex.co.za.